The picture above shows the hand tools that I have in my main tool box. The tool box is in the center of the picture on top of the drawer unit in the center. I have many others in my drawers, on shelves, or just hanging on the walls. 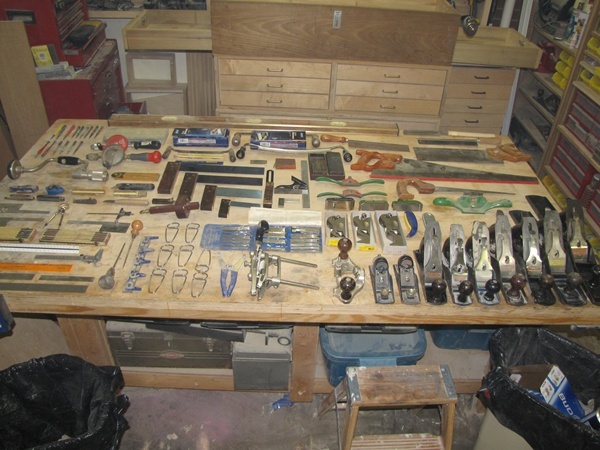 Without thinking exhaustively about this, the following list would be what I would work towards having as a good starting set of hand woodworking tools. There is no doubt that I have forgotten something. Also no two people will have the same opinion on this subject. I will say this, you can do a whole lot worse than setting your mind on learning how to use the tools on this list well before acquiring any others. One or two wood levels would be nice – maybe 24 to 48 inch range. Several straight edges wood be handy to have; you can start out with the steel rules. water stones, arkansas stones, etc. Files are useful so add to these when you can. If you want to do this right you will need to have the files that you need to sharpen your saws. You can make a saw vice that works with your cabinet vice. You will also need a saw set. You can start out by paying someone to sharpen them when needed. obviously the more mechanics tools you have the better. You can never have enough clamps but you can start out with the simple bar clamps that go on pipe and just invest in a collection of pipes. They also make some fittings for making clamps out of wood using either holes or notches in the wood. I have worked in the woodworking industry for the past 40 years. During that time I have been exposed to a lot of different woodworking machines and techniques and have grown to love woodworking. I have also been a hobby woodworker for all of those years although I haven’t had the opportunity to pursue this part of woodworking as much as I would have liked because of the time constraints forced on me by my career in the industry and my lack of an adequate place to pursue it such as a well equipped home work shop. Nevertheless, I have never lost my love or enthusiasm for this fascinating hobby nor the appreciation for the beautiful furniture and crafts that are produced by those who are engaged in it. My career has also been a rewarding one and has allowed me the opportunity to gain knowledge in other industrial related pursuits besides woodworking such as engineering, electromechanical maintenance, electromechanical controls, machine work and design, and other fields of talent that will generally be used in a productive industrial woodworking facility on a daily basis. Fortunately, most of these talents are also compatible with an an active hobby woodworking career and can be used to enhance it since the woodworker is invariably engaged with the use of hand and power tools and all sorts of woodworking machinery and in some cases even designs, modifies, and makes these for himself. My shortcomings arise from not having had the opportunity to develop my woodworking skills to the potential that I am capable of and the level where I want them to be. Woodworking is a hobby where one’s skill is usually commensurate with the time to which he is able to devote himself to it. Practice makes perfect is an easily understood phrase and generally rings true. Nevertheless, I am able to build jigs and fixtures, kitchen cabinets, bookcases, and furniture to an adequate skill level that would allow me to support myself financially in woodworking even if not to the level that I might desire. However, that is not what I am after. At this point in my life I want to increase my skill level to the point where I can make furniture and other wood crafts that are not only beautiful but are also well designed and made. At least for the first time in my life I have enough free time to at least make a reasonable attempt at pursuing this goal. With this blog I will attempt to document this effort.